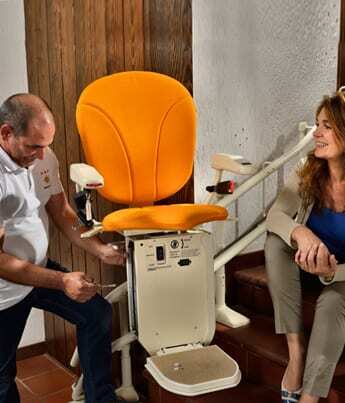 Domestic Lift Services are an independent local company with many years of local experience, we really do try and help so if it is anything stairlift related, please contact us direct. been trading locally since 2001. We have From the friendly team who’ll welcome you to our showroom to the engineers who install your new straight or curved stairlift or ceiling track hoist, you’ll find Domestic Lift Services employees are always approachable and ready to help. When it comes to contact we’ll do our upmost to give you a single, named point of contact for queries and updates throughout your time with us – and we guarantee no pressure selling. As you’d expect from a company that’s been established since 2001, all our staff have plenty of experience – the three Directors alone have over 100 years in the industry! From the friendly team who’ll welcome you to our showroom to the engineers who install your new straight or curved stairlift or ceiling track hoist, you’ll find Domestic Lift Services employees are always approachable and ready to help. As you’d expect from a company that’s been established for 15 years our staff have plenty of experience too – the three Directors alone have 99 years in the industry! All of the products we sell have been tried and tested by us to ensure they meet the sort of high standards that you’d expect from something that you’ll want to use for years into the future (although regular servicing is advised to keep them trouble-free). Our prices are competitive but if you are looking for even better value, reconditioned stairlift models are sometimes available. Our accessible showroom is conveniently located near junction 4 of the M40, less than 20 minutes from the M25. We’re open Mon-Fri, 8am-5pm. We’re members of the Lift and Escalator Industry Association, and have ISO9001 accreditation to ensure we maintain our high quality standards. This, coupled with our experience, is probably the reason why half a dozen local authorities regularly contract out work to us.